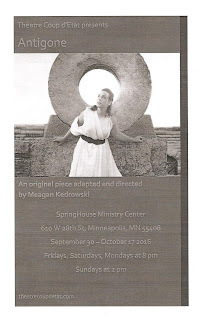 Sitting in the lounge at SpringHouse Ministry Center (a venue I was familiar with from this year's Fringe), waiting to see Theatre Coup d'Etat's new adaptation of Sophocles' Antigone, I read the Wikipedia plot summary, as I often do before I see a really old play. The story of the sister who is condemned to death for giving her brother a proper burial started to sound familiar to me, and I realized I had seen it before, only it was called Burial at Thebes, and it was a sort of gospel retelling by Irish poet Seamus Haeney. Sophocles' trilogy of this ancient doomed family begins with Oedipus the King (you know Oedipus, the guy who was cursed by the gods to kill his father and marry his mother), continues with Oedipus at Colonus (which also has a gospel retelling called Gospel of Colonus), and ends with the story of Antigone, Oedipus' daughter. Also related is Aeschylus' Seven Against Thebes, which tells the story of Antigone's two brothers who fought over control of Thebes after their father's death (which I experienced as a "hip-hop musical comedy-tragedy in Ten Thousand Things' The Seven). All of this preamble is just to say I was more familiar with the world of Antigone than I thought, and felt comfortable jumping right into this intense 90-minute adaptation. It's a story, or rather a piece of a story, that's been told many many times over the last few millennia. But a story that's still worth hearing, especially this version, which focuses on a strong female heroine standing up for her family and doing what she believes is right, no matter the consequences. 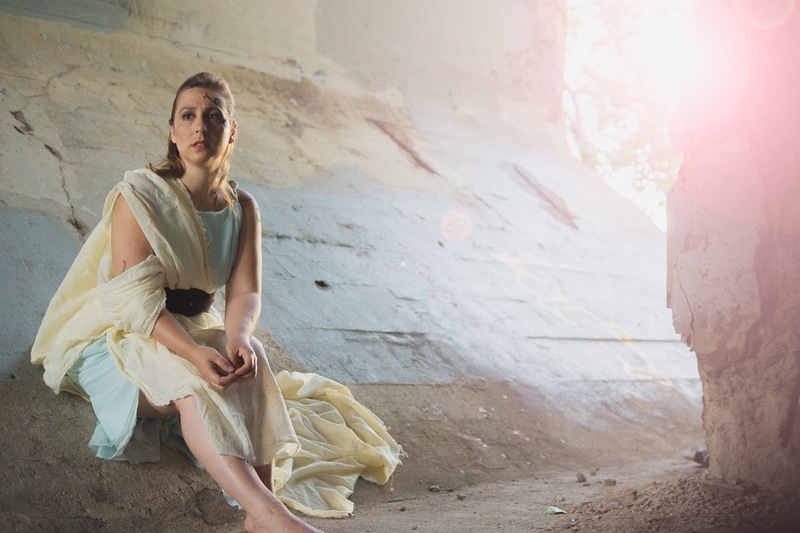 Don't worry if you don't know the background or anything about Antigone's story; adapter and director Meagan Kedrowski nicely sets it up with a short intro explaining that we're about to see Chapter 3 of the story, and briefly telling us about the first two chapters. The sisters' nurse serves as the storyteller, snapping her fingers to breathe life into the figures onstage (who stand motionless for several minutes as the audience files in), and occasionally taking us into flashbacks that further illuminate the characters. Our story begins when Antigone's uncle King Creon declares that Polyneices will not be allowed a traditional burial due to his treason against Thebes. Antigone argues with her sister Ismene that they need to bury their brother; no matter what he's done, he deserves that much. She goes forward with her plan alone, knowing that the punishment is death. She pleads for mercy from her uncle when he finds out what she's done, but he's unrelenting, even when his son Haemon, Antigone's betrothed, adds his pleas. There's no happy ending to this story, only difficult choices. The story is staged in a sanctuary at the SpringHouse Ministry Center in an almost Ten Thousand Things sort of way, i.e., just two rows of chairs on three sides of a square. The church-like feel of the room and booming acoustics provide a somber, regal feeling to the story. The cast walks through and behind the audience, at times speaking or murmuring from behind, making you feel surrounded by the story and immersed in it. Musicians Sarah Dewhirst (piano) and Steve Modena (guitar and percussion) add a soundscape to the story. Morgan Groff's costumes have a Project Runway feel (in a good way) and all relate to each other, while quickly letting us know who's who. Also cool and character defining are the mohawk-like hair styles and intricate face and body paint. This is a very physical performance, with several thrilling and intense fight scenes (choreographed by Adam Scarpello). Highlights in the strong cast include Lauren Diesch as a strong and compelling Antigone, Jayme Godding as her sister Ismene, Jeff Groff as her sympathetic fiance, and Kelly Nelson, Franklin Wagner, Patrick Webster, and Antonia Perez as the guards/fates, who do a lot of the heavy lifting (literally) and provide a bit of humor or creepy atmosphere when called upon. 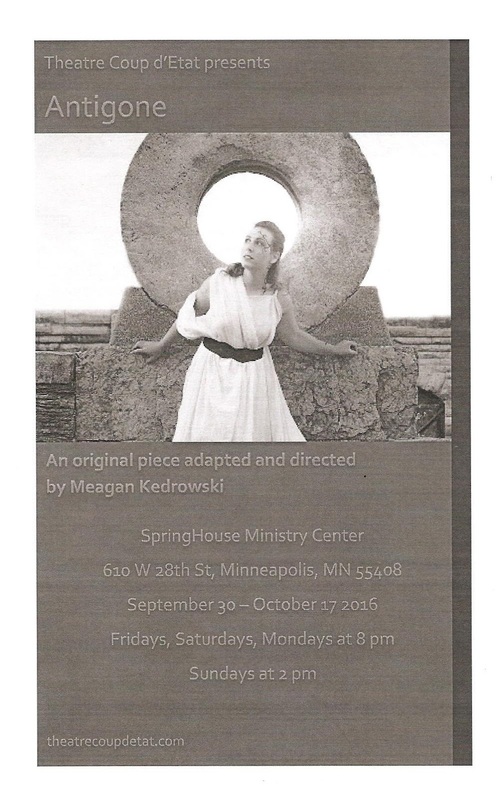 Antigone continues through October 17.